With the rising cost of college tuition, many families figure they’ll have to beg, borrow and steal to pay for the cost of higher education. 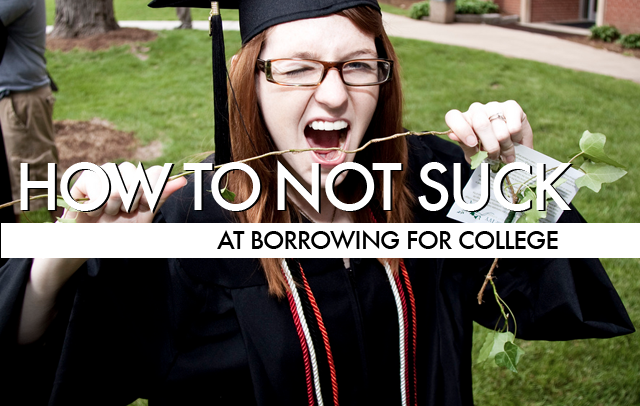 If those are the only options available to you, we recommend borrowing. Close to 60% of the nearly 20 million Americans who attend college each year need to borrow to meet the cost, according to the Almanac of Higher Education. If your college savings plan has fallen short, it’s time to look at your borrowing options. Don’t eye your retirement nest egg as a source for college funding. Let’s repeat that for effect: Don’t eye your retirement nest egg as a source for college funding. If you take a loan from your 401(k) plan, you’ll deplete assets that you’ll need someday. Sure, you say you’ll pay the loan back through payroll deductions. But if you lose your job, you may have to repay the entire balance in 60 days. If you don’t, the loan would be considered an early withdrawal (if you’re under age 59-1/2). That means you’ll owe a 10% penalty and income taxes. Plus, the withdrawal would be considered income on financial aid forms, so you could ruin your student’s financial aid chances. Roth IRAs are another retirement vehicle that have been touted as a good source for college funding because you can take penalty-free withdrawals for qualified education expenses. Alluring, perhaps, but why blur the lines between your long-term goals? If you have money to invest for college, stick with a college-specific account such as a 529 plan. If you’re considering a Roth because you’re not sure Junior will go to college, remember you can change the beneficiary on a 529 plan to another child, other family members and even yourself. Remember, you can borrow for college, but no one will lend you money for retirement. Your home’s equity might be another temptation, but it might not be the smartest choice. While interest on home loans is usually tax-deductible, with today’s rates, you might find they’re more expensive than federal student loans — and market watchers expect interest rates may rise sooner rather than later. Also, if you take out a home loan and park the money in your bank account, it will appear to the financial aid formulas (the calculations used by schools to determine how much aid a student needs) that you have lots of available cash, which will work against you in the financial aid arena. Don’t forget you’re putting your home at risk if you ever have trouble paying back the loan. If that happens, you’d better hope your graduate gets a job that pays well enough to support you. There is already around $900 billion in outstanding federal student loan debt, and at least another $150 billion outstanding in private student loans, according to the Consumer Financial Protection Bureau. The majority of borrowers have the right idea — always take the federal loans before you shop for private ones. The reasons are simple: interest rates are more favorable and repayment plans are better. Compare that to private loans that can run as high as 19% or 20% — a no-brainer. You can read more about the differences between federal and private loans from the Department of Education. If you have your heart set on helping your student graduate without loans, you should still consider having her take the federal loans in her name. The rates are better than what you’d find elsewhere in most cases, and you can always take over the payments for your student. And one morbid yet critical must-do: If you decide to take loans for your student or if you co-sign for her, consider taking out a term life insurance policy on the student for the value of the loans. A couple of hundred dollars a year in premiums could save you lots of heartache and debt should your student die unexpectedly. Don’t blow your shot at valuable tax credits by taking too much from of your college savings accounts too soon. You see, the IRS won’t let you double-dip and use two tax benefits for the same education expense. Let’s say you have a 529 plan. You’ve benefitted from tax-free growth and tax-free withdrawals. Let’s also say you’re also eligible for the American Opportunity Tax Credit, or AOTC — which helps on the first $2,500 of qualified education expenses. You can’t pay for those first expenses from a 529 plan and then take the credit. The IRS calls that double-dipping. Instead, pay out-of-pocket for those initial costs so you can qualify for AOTC, then take your 529 withdrawals for the remaining costs. The Internal Revenue Service doesn’t make it easy, and there are income phase-outs and lots and lots of exceptions and requirements for each potential tax benefit. Check out this handy FinAid.com chart which spells out which college tax benefits can be used at the same time. To be safe, consider investing in a sharp tax preparer.